Easy Tofu Scramble. | Eat More Plants. Had some instagram inspiration for this wrap. An inspirational blog whose photos are literally mouthwatering. I love everything Jen makes! Tofu can be a nice addition if you have a bunch of fresh veggies without that one thing to pull them all together. As always, I stress the importance of only buying organic and GMO free tofu/ soy products. GMO soy is pretty awful stuff. Wraps: any large leaf green veggie or tortilla. Collard green are my favorite for wraps because of their flexibility and size but kale and lettuce work fine. Toss in garlic, onion and bell peppers. Cook over medium-low heat for 5 minutes or until softened. While peppers & onions are cooking, lay a few paper towels on a plate. Place tofu on the paper towels and smash with a fork to crumble. The paper towels will absorb the excess water in the tofu. Add crumbled tofu, cumin, turmeric, 1/4 teaspoon salt and pepper to your hot pan of veggies. Add red pepper flakes here too if using them. Stir and sauté for 5 minutes. Add greens and cook until wilted, just another minute or so. 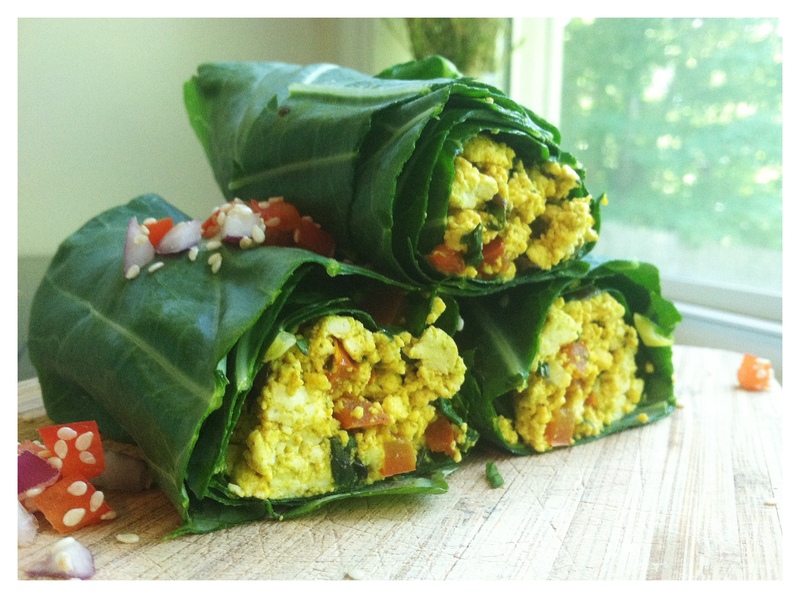 Lay whatever wrap you’re going to use on a plate, pile on your tofu scramble, roll and eat!